Take your morning breakfast table service to the egg-streme with the Argon Tableware Rustic Natural Slate Egg Holder Tray - the perfect way to bring some classic country farmhouse styling to your dining table or restaurant. Crafted from genuine natural slate, this serving platter offers the opportunity to present a breakfast staple in a manner sure to delight your guests. 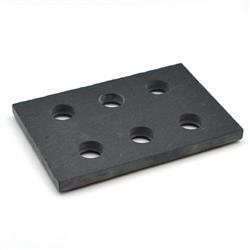 Carefully crafted holes allow the presentation of up to 6 eggs; perfect for most large dining and restaurant tables. The natural heat-resistant properties of slate mean you can serve both hard and soft-boiled eggs straight from the pan - no need to wait for them to cool. Care and cleaning couldn’t be simpler, too - simply wipe clean with a damp cloth. Soft, padded rubber feet on the base protect table tops and surfaces from scratches. For table service that truly ticks all the boxes, or even just to create a unique twist on your kitchen and refrigerator storage setup, Argon Tableware has all the supplies you need for a truly egg-cellent kitchen and dining experience. A well organised website with clear definitions mean I now own well structured items which fit right in with my kitchen decor. Cool egg holder! Is great.